Children can develop diarrhea from a variety of sources, including teething complications, a virus, a reaction to medicine or even food poisoning. The two main goals in treating a child with diarrhea are to help get his gastrointestinal system back in a healthy way and to make sure he doesn't become dehydrated. A special diet can help make his system healthier, and plenty of water or sports drinks can also help keep him hydrated during what is -- it is hoped -- a short-lived condition. New parents are often made familiar with the B.R.A.T. diet through information provided by their pediatrician. B.R.A.T. stands for bananas, rice, apple and toast. 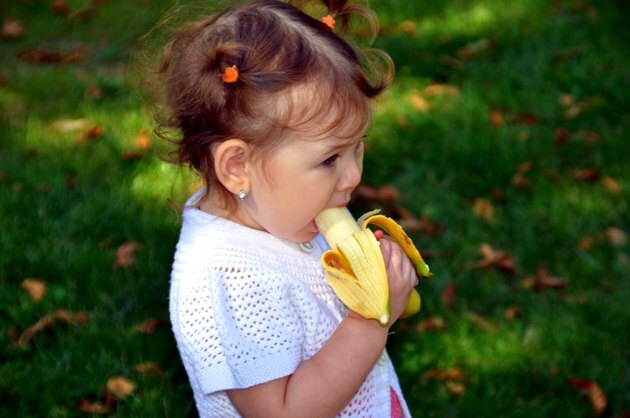 Bananas are packed with potassium, which is an important electrolyte that is lost in diarrhea. These items should be given in small doses at first until a child's appetite comes back and she's ready to eat more. These foods all help to harden stools, but they shouldn't be given to young infants unless otherwise recommended by your child's pediatrician. If a child with diarrhea is also vomiting or simply won't eat any B.R.A.T. items, give him water or sports drinks that provide electrolytes lost due to the diarrhea. Becoming dehydrated will only make a sick child feel worse. Try to have your child take a good sip every 10 minutes or so. Flat soda, apple juice and broth or bouillon may also help keep kids hydrated and settle their stomachs in the process. Do not give B.R.A.T. foods to a person who is actively vomiting, but you may give them to someone experiencing acute diarrhea, which means suddenly having watery bowel movements over a period of a few days. Chronic diarrhea is an ongoing condition and may need to be treated with medications, as well as a special diet. Once diarrhea sets in, the B.R.A.T. diet should begin by day two. After you have started the bland B.R.A.T. diet for your child, you can begin -- on the third day -- to include soft-cooked eggs, sherbet, cooked fruits or vegetables and plain chicken or turkey. The two main foods to avoid when feeding a child with diarrhea are milk and related dairy foods, along with greasy or fatty foods. Wait at least three or four days, even if bowel movements have returned to normal, before reintroducing milk and dairy foods into a child's diet. Other foods to avoid in the days immediately following the start of diarrhea include raw citrus fruits, raw vegetables and extremely-cold foods and beverages. A bout of diarrhea may be a one-day reaction to a gastrointestinal disturbance, but it also may signal the onset of an ear infection or other illness that requires medical attention. If diarrhea lasts for more than a day, and is accompanied by symptoms such as vomiting, high fever or pains in the ear or abdomen, consult your child's doctor. If no other symptoms present themselves, call your doctor's office and speak with a nurse if diarrhea lasts two days or more.